Day 1 of the Tiger Balm Singapore Boccia Open 2018 kicked off this morning with 35 top athletes from 4 Asian countries battling it out for top honours in the individual event. Competition was intense with representatives from Malaysia, Republic of Korea, Thailand and Team Singapore taking part in the round-robin format. Team Singapore spexScholar Toh Sze Ning dazzled the crowd with a 8-2 finish, beating compatriot ElaineEng. Toh narrowly lost out to Korean Kim Deubora 2-3 in another match in the BC3 category. Up and coming athlete Aloysius Gan, who at 12 years old is the youngest Team Singapore athlete in the competition, did well in his opening match with a 9-1 victory against compatriot Gareth Ho. But Gan later lost to Thailand’s Kla-Han Ladamanee in the BC3 category. Among the day’s top performers was World No.3 in the BC2 category, Thailand’s Saengampa Worawut. He showed why he is a force to be reckoned with, throwing with great precision as he thrashed Korean Shin Wooseob and Singaporean Gan Sun Ling 17-0 in both matches. Ms Sim Ann, Senior Minister of State for the Ministry of Culture, Community and Youth and the Ministry of Communication and Information, graced the event as the Guest-of-Honour as she welcomed the teams at the opening ceremony this morning. 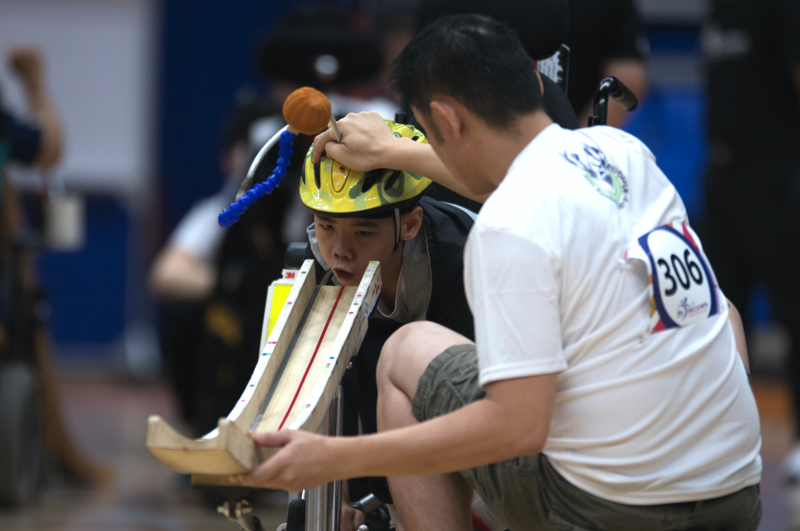 Organised by the Singapore Disability Sports Council (SDSC), the Singapore Boccia Open made its return after a 10-year hiatus, thanks to a S$70,000 sponsorship from Tiger Balm. The round-robin stage of the competition will continue tomorrow morning. Semi-finals are slated to take place later in the afternoon. Spectators can catch all the exciting action at the four-day event, held in the sports hall of Heartbeat@Bedok until Saturday, 2 June 2018. Admission is free. All Images to be credited to Alfie/SDSC unless stated in caption. Daily results will also be regularly updated on SDSC’s Facebook page and Website. Singapore Disability Sports Council (SDSC) is the only organisation in Singapore that caters to sports for persons across all kinds of disabilities, over 20 sports. It aims to help persons with disability lead full and independent lives through sports. Besides providing sporting opportunities for them to realise their potential, SDSC trains talents to represent Singapore and pursue excellence at regional and international competitions.